There’s a particular thrill that runs through us all when an embossed invitation tumbles into the letterbox. And for the 200 guests who attended Emanuela Santi and Andrew Peña’s three-day wedding in Italy this summer, the rush of excitement and anticipation was even greater than usual. That’s because the watercolour-style, floral invitations were not the only indication of the extravaganza ahead. After all, Emanuela herself is something of a local legend, and it’s not often that you are invited to the nuptials of a renowned Italian design guru. An events planner and designer, Emanuela is known around Hong Kong for her impeccable taste. And she certainly knows how to throw a party—she organised supermodel Naomi Campbell’s 40th birthday bash and has worked extensively at the Cannes Film Festival. But for an Italian girl living between Hong Kong and London and engaged to a Puerto Rican investment banker, the most pressing question was where to hold the wedding of the century. “Being Italian there was no other country I could think of that would measure up to the great food, wine, energy and atmosphere of Italy,” says Emanuela. The moment Emanuela laid eyes on the 15th-century villa, which boasts a swimming pool, lakes, vineyards, olive groves and—befitting its rock star owner—a recording studio. She went weak at the knees. "On the day, make sure you keep holding hands and never let go of each other, so you can enjoy all the unforgettable moments as a pair"
“For the welcome dinner on the first day, my idea was ‘Florence of Bohemia’, taken from the tiles, architecture, colours and Medici history [of Florence],” she says. “I was inspired by Morocco and Boho culture, but also by a photo I had seen of Margherita Missoni’s wedding with cushions on the floor in lots of patterns." But instead of patterned cushions, Emanuela sourced rugs from Turkey in fuchsia, green and orange, and mixed them with vibrant flowers such as bougainvillaea and peonies, alongside orange trees and pineapples. And the Turkish and Moroccan inspiration continued throughout the event, from the traditional North African vases to the metal serving dishes, lanterns and water flasks. Aside from Mediterranean and Middle Eastern motifs, the couple was determined to bring in elements of Hong Kong as well. Not only did the pair share a home in the Mid-Levels, they also met at the now-closed Socialito on Wyndham Street one packed Friday night in 2014, and they wanted to pay tribute to the city that was their matchmaker. Emanuela’s favourite piece of design from the wedding was a simple ode to China in the form of hand-painted plates featuring Chinese rice farmers, designed to match the custom-made glassware. On these hand-painted pieces, guests ate homemade pasta with burrata and tomatoes, followed by tagliata with rosemary and rock salt. 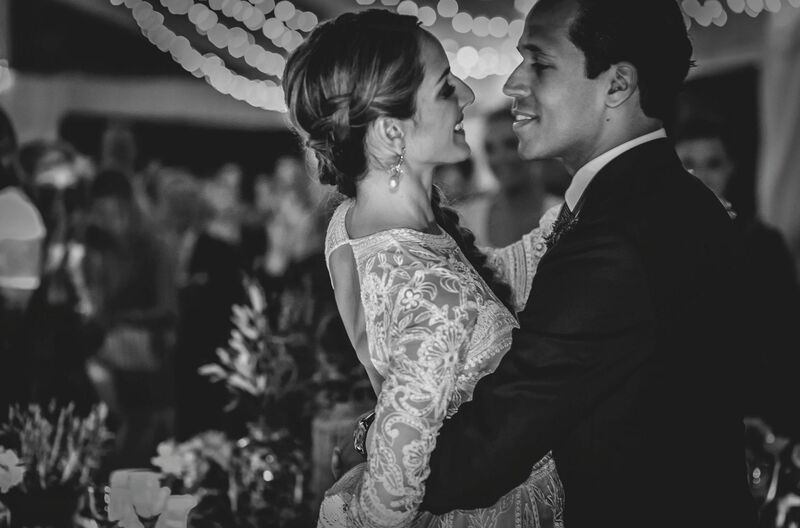 A scroll through Instagram (#drewela) show a truly exquisite wedding that combines style, beauty and originality. It also includes a few magical and intimate moments. The memory Emanuela keeps returning to is the moment as she and Andrew sped away from the church towards the sunset in a vintage MG car. “I closed my eyes and would then open them to a vision of rolling Tuscan hills, flowers in my hair, bouquet in hand and the evening breeze setting in. We felt completely free and totally in love with each other,” says Emanuela. Although the couple wasn’t exactly alone in that vintage red sports car. Under Emanuela’s bespoke couture Naeem Khan lace dress was a barely noticeable bump, one that has today transformed into a gurgling, pink-cheeked two-month-old baby named Penelope. “It was a great feeling that our little girl was living all of these moments vicariously through us,” she says.